It has been more than 50 years since Rene Clement’s adaptation of the Patricia Highsmith thriller, The Talented Mr. Ripley, was released in theaters. Entitled Purple Noon (1960), it has been eclipsed in the popular imagination by Anthony Minghella’s take on the book starring Matt Damon and Jude Law. Both versions are very different adaptations and it is about time that Clement’s film was rediscovered and with it Alain Delon’s brilliant performance. Tom Ripley (Delon) has been enlisted by the father of one Philippe Greenleaf (Ronet) to bring his son back home to San Francisco. The carefree man is spending his family’s money in Italy. We meet them hanging out at a sidewalk café until Philippe’s friend Freddy (Kearns) shows up and immediately voices his disapproval of Tom who he sees as a leech, feeding off of Philippe. He has no problem spending money, “buying” a blind man’s cane for 20,000 lire and then proceeds to pretend to be sightless and picks up a beautiful young woman only to sell her the cane for 30,000 lire! This opening sequence gives us some pretty decent insight into Tom and Philippe – rich pretty boys that do whatever they like because they can afford it. So far, Purple Noon comes across as something of a buddy film – two guys laughing and spending their way through Italy. However, as Philippe and his girlfriend Marge (Laforet) make out in another room, Tom tries on some of his friend’s clothes, admiring himself in the mirror. Then, he begins to style his hair like Philippe and even proclaims his love for Marge all the while kissing his own reflection. It is an incredibly narcissistic moment that speaks volumes about Tom’s true nature. Tom may be using him for his money but Philippe enjoys tormenting Tom and seeing how much mental abuse he’ll put up with. Philippe knows that Tom is just a wannabe and delights in being cruel to him. Tom isn’t just jealous of Philippe’s life – his money and his girlfriend Marge – he actually wants to be him and with cunning thought figures out a way to do just that. 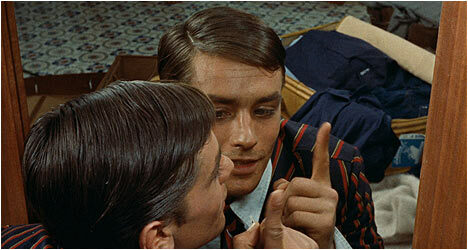 Purple Noon features a series of fascinating mind games as Tom manipulates those around him to get what he wants. Alain Delon plays the perfect beautiful blank slate, an amazing mimic that seems like an ineffectual nothing but actually feeds off those around him like some kind of emotional vampire. With his impossibly good looks, Delon is perfectly cast as Tom. He casts a seductive spell on most people he encounters and is a brilliant student of human behavior – hence his ability to mimic others. Those looking for sympathetic characters in Purple Noon – save Marge – should look elsewhere. Clement wisely resists the urge to give Tom some kind of redeeming quality or heartbreaking backstory. He is a murderous manipulator brought vividly to life by Delon in one of his earliest significant roles and demonstrated his impressive acting chops. Clement’s film is a fascinating adaptation and one that is more faithful to the source material than Minghella’s version. With its sun-kissed Italian scenery, Purple Noon looks breathtaking on Criterion’s newly minted Blu-Ray edition. The transfer is in pristine condition while still retaining its original filmic qualities. “Denitza Bantcheva on Rene Clement” is an interview with the film historian and writer. She gives us a little biographical sketch of Clement and talks about how he got into filmmaking, working on documentaries. Bantcheva is very knowledgeable about the director’s life and career. There is an interview with Alain Delon that aired on a French television program in 1962. He talks about how he started acting and working with Clement. Amazingly, he had no formal training as an actor and no real desire to do it – it was something he sort of fell into. Also included is an interview with author Patricia Highsmith that aired on French T.V. in 1971. She is refreshingly candid about literature and her method of writing. Highsmith was not big on having a lot of friends or family, which may explain antisocial protagonists like Tom Ripley in her fiction.